During the coldest winter in at least 25 years, Dream finishes two more zeroDELTA aspheres in its dedicated and extremely stable polishing/testing room. Shown to the right is a 20" f3.5 paraboloidal mirror; 3.0" edge height, <20 pounds. Click on the image to gain access to extraordinary videos that illustrate the stability of both Dream's polishing/testing room and a large zeroDELTA lightweight mirrors. Elbit Systems (Israel) visits Dream to learn more about its core technologies and potential use for space telescopes. European telescope manufacturer receives first Dream 10" f3 zeroDELTA primary mirror blank for their Cassegrain telescopes. "Can I say: holy cow!! This looks awesome!! Can't wait to get my hands on it." - after receiving high-resolution photos prior to shipping the mirror. "Just a quick update: mirror blank was delivered. It looks marvelous. Thank You!" Dream finishes two more lightweight aspheres: 16" f3.0 and 16" f3.75. 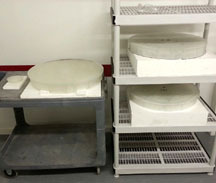 Both mirrors were produced, fully processed & finished in-house. They have the same smooth Mid-Spatial Frequency (MSF) and surface roughness errors as shown on this page. 247mm CA, f2.27 engineered lightweight mirror that was fully processed inside Dream. The view is through the bubble-free optical face. It is one of three different mirrors that Dream designed, engineered, and processed for this AO project, which is looking to achieve 0.3 arc-second (free-seeing limit) resolution across the science field of the 2.2m telescope. Dream also designed and did full engineering of the dedicated carbon fiber and carbon fiber sandwich core mirror mounts for each mirror. Dream delivers a fast & demanding 300mm CA f3 (system f-ratio) Ritchey-Chrétien optical set for visual spectrum application. These high departure lightweight mirrors were designed and engineered from scratch, based on the customer's support hardware and requirements. Both Dream mirrors are bubble-free and have a double-conical profile which feature tapered ribs, numerous rib heights and thicknesses (all optimized through iterative FEM/FEA, for both polishing displacement and gravity displacement). Dream not only designs the mirrors but also casts, anneals and can process them in-house. This allows Dream complete design control, as well as empirical knowledge that is fed back into current and future designs. We have been designing, engineering and using lightweight mirrors in our carbon fiber instruments since 2003. 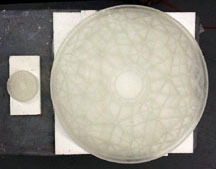 The photo above shows the as-cast, bubble-free mirror blank, prior to any work being done to it. 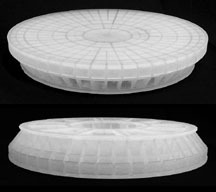 Dream can directly cast convex, plano and concave surfaces. Dream casts and finishes it's fastest mirror to date, f1.376, for an Adaptive Optics (AO) project. The bubble-free mirror is six times lower in areal density than Hubble's M1. This 16.7" physical OD mirror weighs just 9.5 pounds and is nearly 6:1 aspect ratio over its CA. This is one of three mirrors (396mm f1.376, 247mm f2.26 and 393mm plano) that Dream produced for this client. Each is mounted in a dedicated CF and CFSC mirror mount, engineered and fabricated inside Dream. Dream did all work to this mirror inside our dedicated 7000 square foot facility in Nazareth, PA. This includes: design & engineering, casting & annealing of the raw mirror blank, generation, grinding and polishing. Dream mirror finished to higher quality level than Hubble's M2. * L/125 RMS surface, minimum L/20 P-V surface (632.8nm). * Radius off by only 15 microns; desired - 629.4mm, actual - 629.385mm. "We shall look back and see how inefficient, how primitive it was to work with thick, solid mirrors, obsolete mirror-curves, ..." - George Willis Ritchey 1928: JRASC, Vol. XXII, No. 9, November 1928. New polishing & testing room complete. * The new space separates out initial generation & grinding work from polishing. * The new space allows vertical testing over the machines, which has both time and mechanical advantages. Not to mention a substantial reduction in risk to the engineered, lightweight mirrors. * The new space grows polishing and it's required testing by a full magnitude. * It is the most insulated space within Dream's three story building. Even interior walls are insulated. * We will continue fitting out the room with equipment as we also work with new non-contact sensors that have 20nm resolution, which will be used for numerous pieces of equipment. * Generation & grinding is now double it's original space. We are currently working on mirrors ranging from f1.376 to f5.5, with a series of f0.5 concave mirrors that will be cast soon. These mirrors are for everything from Newtonians to Dall-Kirkhams to Classical Cassegrains to Ritchey-Chretiens. Dream can provide full engineering for everything from the lightweight mirror to the carbon fiber mirror support and beyond. We work on applications ranging from IR tracking telescopes & optics to Adaptive Optics (AO) systems for multi-meter telescopes. Dream has nearly completed the upgrade of its largest advanced composite oven. * Increasing air flow with a new, 700 pound 3-phase blower. * Increasing heat capacity with all new, 3-phase heating elements that are 330% more powerful than the originals. * The upgraded oven will ramp faster and be able to achieve much higher temperatures than before. These upgrades are needed because of Dream's continued growth and new capabilities to supply meter-class telescopes. Work is complete. 480 volt, 3-phase power is up and running at Dream's new building. Three transformers had to be added to the local service in order to provide Dream with the power it requires for new equipment, upgrading the large composite oven and future equipment (growth) at Dream. Dream is capable of everything from creating the initial optical design to FEA of the lightweight mirror blanks and dedicated carbon fiber mirror supports to providing it's customers with completely finished opto-mechanical instruments. The new, 3-phase, large casting & annealing furnace arrives. The interior dimensions of the new furnace are 1.4 meters in diameter by 0.9 meters in height. Dream will be producing a 0.85 meter physical diameter mirror for a customer's custom telescope. Dream is proud to add three more to our team. * Former Boeing Mechanical Engineer with extensive FEM/FEA expertise in Carbon Fiber. * Optical Engineer with 30+ years experience in defense-related optical systems. To read their full bios, click here. 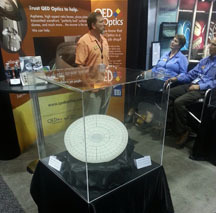 QED Optics to display another engineered, lightweight Dream mirror at SPIE's Photonics West, in San Francisco, CA. Dream casts & anneals three ~24" mirrors within three month's time. The new building is already benefiting both Dream companies. This highlights the reason Dream started casting its own mirror blanks in 2008; to take the place of outside vendors that could not deliver this type of product. Dream is currently doing generation work on these three mirrors, as well as various round and elliptical M2's. Dream successfully casts f2.5 M1 and f2.78 M2 for Dream Telescopes' 24" telescope for NASA project. This telescope will receive lasercom from LADEE, a spacecraft that just last month started orbiting the Moon. A basic overview can be found here. Additional information and a video can be found here. Dream is proud to be involved with this and other projects at the leading-edge of technology. The telescope will be installed in 2014.
displays 16" Dream mirror at Optifab in Rochester, NY. Final figuring of this mirror will be performed by QED Optics using their patented MRF technology. 2013: Dream moves into a new facility. This 3-story shop is three times larger than the previous building. It provides both Dream companies with much needed utilities and space, with plenty of room to grow. The space and additional features that the new facility offers are needed as Dream continues to become more vertically integrated, relying less on outside vendors. 2013: Over the past two years Dream has brought all generation work in-house for Dream Cellular mirror blanks. Generation work includes; plano-grinding the back of the mirrors (as well as the face for plano mirrors), edging, beveling and grinding of convex and concave optical faces. Dream has designed and built machines that are processing the mirrors using loose abrasives, diamond-based tooling and computer grinding & polishing machines. Dream is currently working on setting up vertical testing that will occur over it's polishing/figuring machines. In late November of 2013 4D Technologies will be visiting Dream to demonstrate one of their dynamic interferometers that is specifically designed to show mid-spatial frequency errors. This demonstration will show how it performs in Dream's facility and on multiple Dream engineered, lightweight mirrors. 2013: Dream is currently polishing a custom 16" f3 Dream mirror that will fly aboard a Gulfstream V jet. The completely bubble-free mirror is 16.5" physical OD, 2.5" tall and weighs 9.8 pounds. The mirror is a double-conical design with back flanges. It's areal density is 6 times lower than Hubble's lightweight M1. The telescope will fly in 2014. Press Release - May 12th, 2010: CTE of Dream mirror is independantly tested. The average CTE of Dream's lightweight mirrors is 2.6-2.7x10-6/K. Pyrex and Borofloat 33 have a CTE that is 22.6% higher. Press Release - Late-April 2010: Dream obtains another first light with an instrument designed and built in-house, utilizing Dream's lightweight mirrors. Low mass mirrors allow instruments to hold optical collimation all-sky, on fast instrument using large CCD chip. Rapid thermal equalization promotes high quality optical performance, due to the engineered mirrors. Press Release - Mid-April 2010: Dream debuts recently designed 24" mirror that weighs 28 pounds. Nazareth, PA, November 18th, 2009 - Dream is proud to be recognized by the editors of Sky & Telescope Magazine as a Hot Product for 2010 for our technology and achievements . Dream Cellular, LLC. was formed in 2008 in order to provide its sister company, Dream Telescopes & Accessories Inc., with a more reliable, higher quality and more consistent lightweight mirror blanks. Designed, engineered, and produced in-house, Dream's lightweight blanks incorporate design features not found in any other lightweight glass mirrors. Dream uses extensive engineering in both design, casting and annealing to produce highly efficient cellular optics that have a much faster Thermal Time Constant (TTC) than monolithic optics or thick-featured "lightweight" substrates. Extensive structural engineering and FEM/FEA is utilized to reduce polishing and gravity displacement. The extensive engineering related to polishing displacements makes Dream's blanks uniquely workable by opticians. 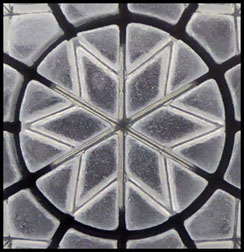 Dream has worked with major glass manufacturers to create the first FEA-based annealing schedules of any commercial company offering cellular optics. Due to their much thinner rib structures and 3-4x greater surface area, these optics equalize (TTC) far faster than standard monolithic optics and their light weight design also makes them easier to support in a rigid fashion. Design features such as axial support locations for traditional flotation cells, insert points with recessed protrusions for flexures, flat profile details in key areas for bipod flexure attachment and a host of other features can all be designed into the substrates, per customer specification. These features allow for easier mounting of the optics and can help the optic maintain a higher level of figure quality. Because the entire process is done in-house, Dream can also very accurately control the as-designed vs. as-cast variances and produce optics that meet or exceed spec. Dream's extensive engineering and innovative designs, coupled with our casting tolerances, means that Dream's engineered cellular blanks are truly unique in the world. Dream knows firsthand how detrimental unreliable deliveries and large casting variances can be. Dream prides itself in producing the most optimized and modern version of the nearly 100 year old technology that is lightweight mirrors. Contact Dream to discuss your latest OEM or individual project. Copyright Dream All Rights Reserved.